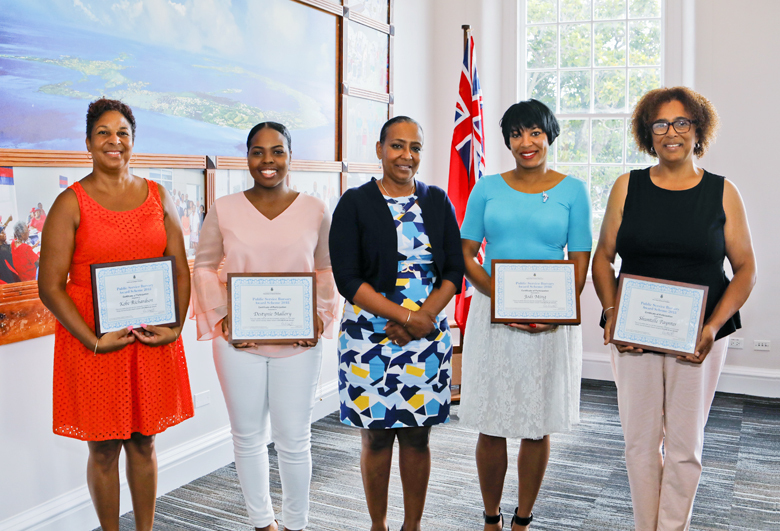 Yesterday [July 25] Minister for the Cabinet Office with Responsibility for Government Reform Lovitta Foggo recognized this year’s Public Service Bursary awardees. This year ten individuals received Bursary Awards. Four are new recipients and the remaining are current bursary students who have been approved for continued funding. 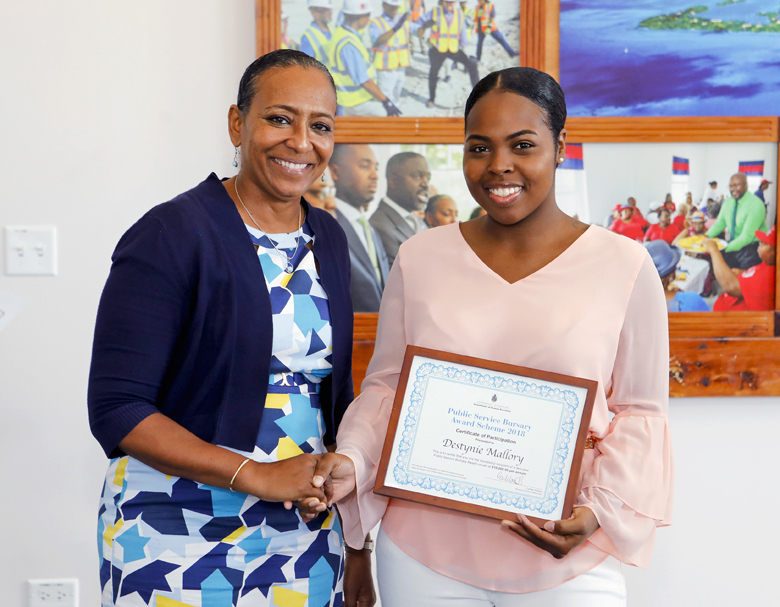 “The four new awardees are Destynie Mallory [pictured], Shuntelle Paynter, Jodi Ming and Kobe Richardson [who are currently overseas]. They are studying in the fields of Forensic Psychology, Clinical Mental Health Counseling, Real Estate, and Building & Construction Management, respectively,” the Ministry said. “The sponsoring departments for these students are the Departments of Court Services, Land Valuation, and Public Lands and Buildings. The Bursary Awards Scheme has supported young Bermudians studying in a variety of highly technical fields. During the presentation, Minister Foggo said, “The four new awardees are Destynie Mallory who is with us today, and Shuntelle Paynter, Jodi Ming and Kobe Richardson who are represented by their parents. “They are studying in the fields of Forensic Psychology, Clinical Mental Health Counseling, Real Estate, and Building & Construction Management, respectively. 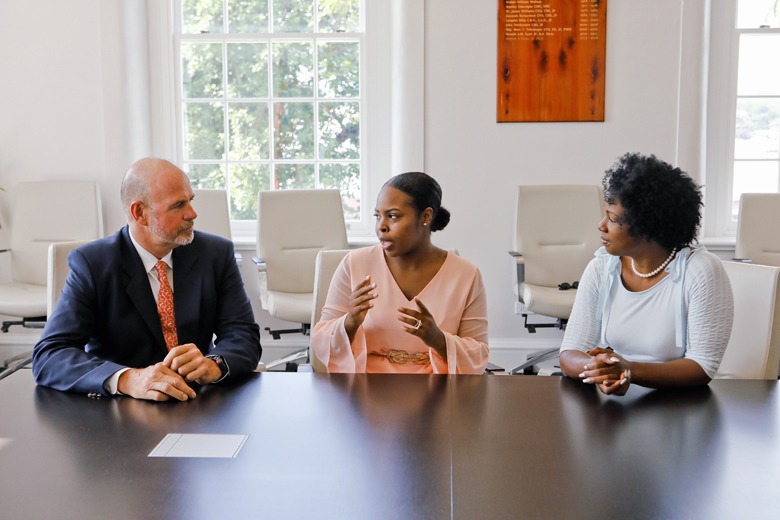 “This Government remains committed to supporting the development of young Bermudians with a view to preparing them to fill essential technical and professional posts within the public service. “There are many occupation groups in the Bermuda Government requiring varying levels of education and training. Some of these areas are deemed hard to fill, meaning that there is a known limited talent pool with expertise in the specific area available on-Island and in some cases there could exist a global shortage of trained resources. 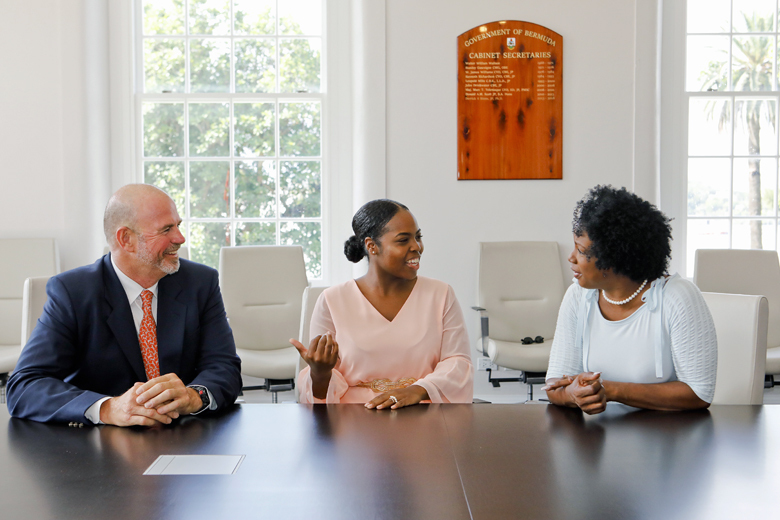 The Public Service Bursary Award Scheme awards up to 14 scholarships annually to Bermudians pursuing post-secondary academic qualifications in a discipline, which has been identified by Government Departments that meet our future needs. The bursaries are valued at $10,000 per year. “This ensures a well-trained cadre of people to fill positions within the Public Service,” said Minister Foggo. Minister Foggo concluded, “Ultimately, our aim is to attract, develop, motivate, and retain a quality talent pool that is committed to the highest standards of excellence. In order to do that, this Government will continue to dedicate its budgetary and career development resources to the Public Service Bursary Award programme. Congratulations, recipients. Do return to your homeland upon completion of your studies. Glad we have this current government. Yes they are awesome! Do I get a t-shirt? Congratulations to these deserved receipients. One must ask where the BDA GVT is actually getting this money. The discussion of Bermuda’s mountain of national debt seems to have evaporated. Not focusing on this could be very dangerous for the financial well being of our country. What’s the status Premier Burt??? Lovitta..looking good in those colours when you coming to St David’s you are missing out on dilapidated buildings, overgrown trees, our lighthouse needs a good overhauling n painting, our not beaches need attention, historic battary needs attention from everybody, roads need cleaning and cutting back of vegetation, one way road needs to be reassessed, stop signs need to be put in place at junction of St. Texas Road and St. Luke’s Rd and another one just below Harry Fox’s corner and Orange Hole. Oh, it has been suggested speed bumps in certain speedways. Did you see videos that were shared on facebook showing things that need to be addressed by you on behalf of your constuency, do we have to wait until the next eelection to see you. Or as it has been said, “are we expected to look after our own community” as it seems we are the only ones that care.